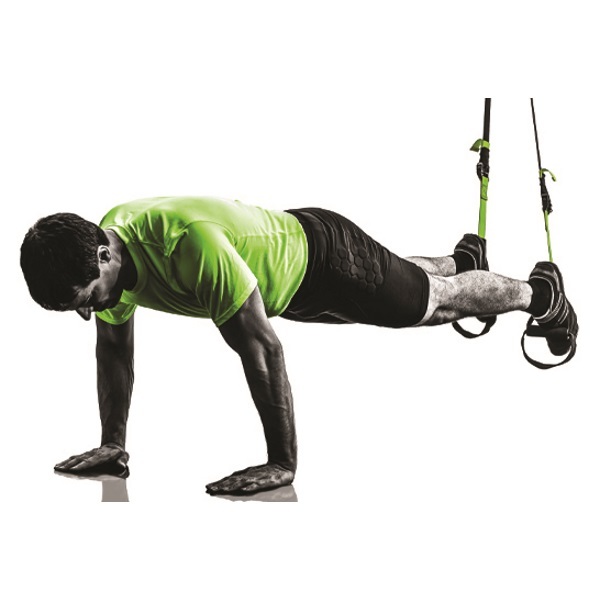 If Crunches and Planks have become too easy for you, but you still don’t have the six-pack you’re looking for, try doing the Bodysaw exercise on a suspension trainer. It will help you develop the thick, muscular abs you want. Bodysaws can be used two ways—as a stand-alone exercise or as an addition to moves like Reverse Crunches and Pikes. Because of its suspended body position, the exercise provides instant feedback on whether you’re using your abs or the rest of your body. When your body is forced to hold tension as the lever angle and weight distribution changes, it reacts by increasing stiffness through the core. It’s not uncommon to get a cramp in the upper abs the first time you do this move. When you’re finished with a set, you instantly know; there are no mindless repetitions like you see in many standard ab routines. Start working for time, not reps. Three sets of 30 seconds is great. Don’t worry about how many reps you get the first time. Focus instead on total abdominal tension and a controlled pause at the hardest point in the middle of the rep.
As you get stronger, work up to 4 sets of 10 reps, with each rep taking about 5 seconds to complete. You can increase difficulty by moving from a forearm plank position to a push-up plank position. To avoid back strain, master the basic version first, so you don’t fall on your face. If you don’t have access to a suspension, trainer, Bodysaws can be done using a variety of other implements. The easiest is a mid-sized Swiss ball, but you can also do them with your ankles on a foam roller.